Sunday morning we all awoke late, and then piled into a bus for a short trip to the farm homestead of one of Igor’s friends. Here we were presented with yet another fabulous feast of food and drink. We were all crowded into a single room, with a large fireplace at the far end. Over this fire fresh meat was being cooked, and the aroma of the meat cooking plus the warm smell of the fire made us all feel very calm and content. We ate slowly, and enjoyed a few toasts, as we all settled into comfortable conversation. After a time, Igor asked several of us if we’d like to play paintball! Kyle, Jeff and I consented, and Igor got several of his Ukrainian friends to join us. We played two rounds, and had an absolute ball! I’m pretty sure my dad took photos of the event, and if he posts them to Flickr I hope he’ll drop a link in the comments. After more toasts and food, we finally prepared to leave for the bus ride back to Kiev. In the U.S. we often have one more drink “for the road”. In Ukraine, they have one more toast “for the horse”, to celebrate and honor the horse that pulls the carriage. We obviously didn’t ride a horse-drawn carriage, but that didn’t stop us from toasting the horse – in this case the engine of the bus – for safety! Our guide for the trip to the Exclusion Zone was the same Sergii Mirnyi who had taken Ann on her trips. He was a delightful, intelligent man who is clearly passionate about his work. 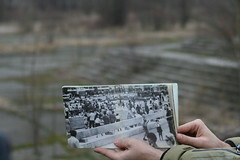 Also joining us was a young man named Sasha, a former resident of the town of Prypiat. His personal insight into the now-abandoned town was a striking addition to our tour. 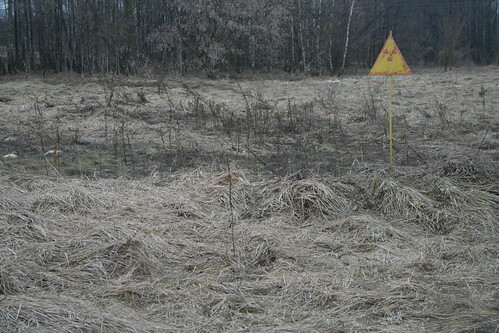 Along the way to the reactor site, we passed a small area which had once contained houses. After the explosion, the houses were razed, and bulldozed over. 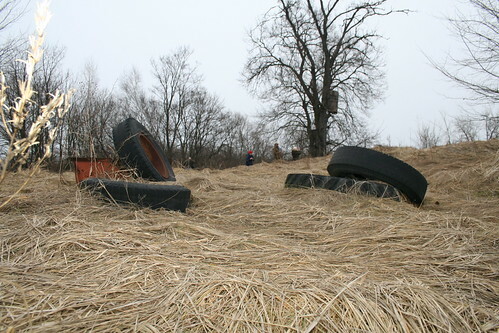 Sergii called his a “graveyard for houses”. While squatting down to take the photo above, Sergii called to me and said “I’ve just remembered that men are not permitted to place their gonads close to the ground!” He went on to say that it was a silly rule, and that there was no real threat to my reproductive organs on this trip, but rules are rules and we could get ejected from the Zone if anyone caught me doing it again. 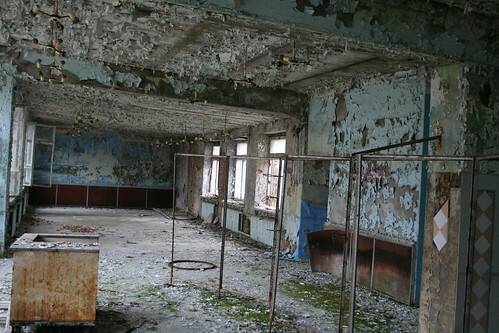 At the town of Prypiat, Sasha took us to the apartment building in which he lived as a young boy. It was eerie to walk through the vacant town, and especially eerie to walk through the deserted building. What he called an apartment building was more aptly called a dormitory: the apartments lacked kitchens, as most meals were eaten in a large cafeteria on the first floor. Inside Sasha’s former apartment was something of an odd shrine. 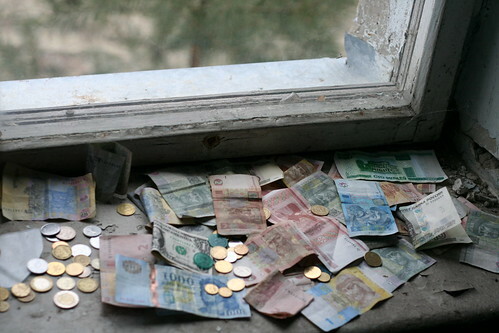 Some time ago Sasha had placed a few hrivna (the Ukrainian currency) on the window sill, in order to determine if people were still looting the place. He thought surely that a bit of hard cash would be taken, but instead the visitors that had come in his absence had left their own money on the window sill! I had to consciously remind myself that the town was abandoned, and that the desolation and ruin was the result primarily of age, because the place felt like a warzone. After the disaster, the residents were told that the evacuation would be temporary, and that they’d likely return home within a couple of days. As a result, few people took many of their belongings with them. 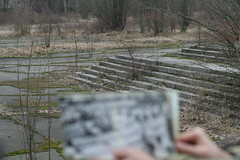 When the evacuation was made permanent, the town of Prypiat was ripe for looting. Over the years as more and more stuff was extracted, the looters became more and more thrifty, going so far as to rip out window frames in order to get money for the raw metal. Sasha had with him a photo book showing the town in its prime, filled with people happily living their lives. At several places he would stand and hold open the book. We would crowd around behind him and look first at the picture he was showing, and then the barren reality of that location today. Sasha runs the pripyat.com website, which was originally created to help the displaced residents stay in touch with one another all these years later. It’s since become a cornerstone of a new NGO working to make the town into an official memorial / museum. It’s a snapshot in time of Soviet culture, as well as a grim reminder of the disaster of 1986. Sergii shared with us a lot of fascinating information. When the reactor blew, the radiation detection equipment simply could not provide an accurate measurement of the radiation because no one had ever expected it to be that high. The disaster was compounded by the fact that the officials had never made any kind of disaster recovery plan: the only contingency planning ever done was military, not civil. The sarcophagus, or shelter, was built in just a couple of months with no real architectural planning or design. 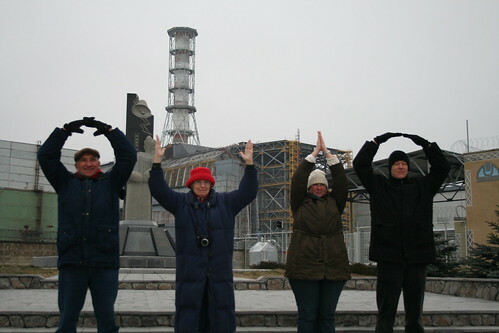 At the reactor site itself is an administrative building which contains a visitor’s center. There one can see a cut-out model of the reactor in it’s (mostly) current state while an official representative explains to you a brief history of the clean-up work done so far, and what future plans for the new sarcophagus include. 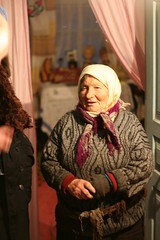 On the way out of the Exclusion Zone, we stopped at the home of a little babushka, where she lived all alone. She evacuated with the others in 1986, but a year later when her mother died she moved back to her family home. There are, in fact, several hundred people living permanently throughout the Exclusion Zone. You can see all of my photos from my trip to the Exclusion Zone on Flickr.